This is going to be a quick guide to spinning up an ASPNET 5 website on Service Fabric. 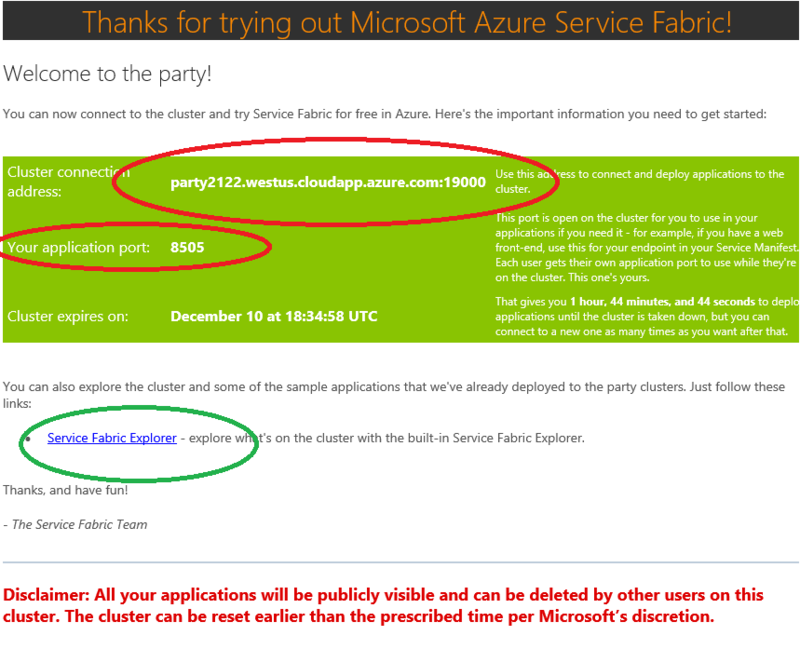 To host it we’re going to use the “Party Cluster” service from the team. This lets you grab a slot on a free public Service Fabric cluster to try out things and get up to speed. Once you’ve requested access to a cluster (Tip: Pick the one with the most time left to run on it!) you’ll get an email like this one. The three key bits of info are highlighted, we’ll use these to host our website! Have a read of the rest of the mail too as it details the limitation of the party clusters, limited time, shared etc. First up the green circle is the link you can use to see the Service Fabric Explorer, we’ll use this later to see our app provision and check it’s health. Now lets create our website and publish it to the cluster! I’ll assume at this point that you’ve followed the install guides for getting your local environment setup, don’t worry if you haven’t .. I’ll wait. Head here and follow the guide. So now that’s all set lets get into it. Jump into VS2015 and create a new Service Fabric project, then select “ASP.NET 5” lastly select “Web Application” and for simplicity set it to have “no authentication” (this isn’t a must just keeps the project simpler). Here is a quick recording of the process. 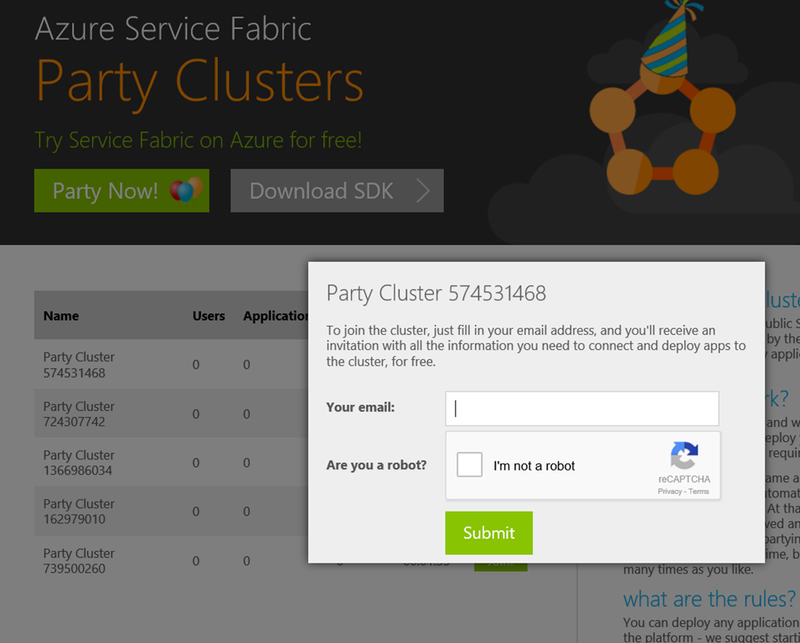 Add in Port=”8505”, but replace this with the application port you received in your email from the party cluster. Then you’re all set, you can right click on the Service Fabric project and click publish. It will then push your project to the cluster and spin up the service on the nodes. Once it’s done you can navigate to your http://cluster:applicationPort and you’ll see your website up and running. You can also navigate to the Service Fabric Explorer, with the link you got in the party cluster mail, and have a look at the health status of the application and serivce on the cluster nodes. Now you’ve got your simple web frontend up and running on Service Fabric it’s time to dive into the fun stuff. Take a look at the StatefulService and Actor programming models and start building out your microservice based application. There is great content to get you started on the Azure site here!